Re-designed; Now Better Than Ever! Hard Shell Nuts? Here's your solution! We were excited to offer you the Steel Nutcracker I and it became a best-seller! Now, we've made it better and we are even more excited to offer you a re-designed nutcracker-- Introducing the Steel Nutcracker ][!! I sell a lot of nut crackers. My Kinetic Kracker (Electric Pecan Cracker) and Drill Cracker (for black walnuts and hard shell nuts) are leading nutcracker sellers on eBay. I ship them around the world. Even so, sometimes there comes along something that makes me say, "Why didn't I think of that!". This black walnut cracker is one of those items. 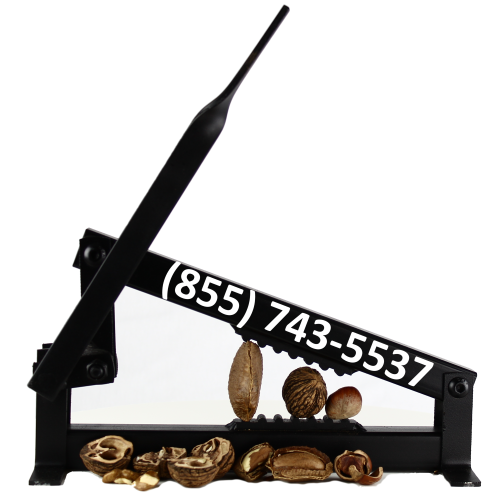 The lever-fulcrum action makes cracking the hardest nuts child's play. It provides superior cracking with a minimal amount of shatter versus standard nut crackers by allowing the user amazing precision pressure control. Apply easy pressure to increase cracking and reduce shatter (and shrapnel!). New to the Steel Nutcracker ][ design is the double steel teeth. On older models or on other nutcrackers, nuts are placed for cracking and one set of steel teeth is suppose to hold the nut in place. This method can cause nut slippage and wasted time. The Steel Nutcracker ][ features both an "upper" and "lower" steel teeth so that the nut stays in place-- no slippage! Perfectly cracked nut every time! How many times have I used the diagonal pliers and nut picks to get out the tiniest and most aggravating pieces if nutmeat?GRRR! That's ended now because this simple nut cracker can re-crack those stubborn little pieces. Of course most black walnut crackers can handle English walnuts- if you like shattered nutmeat! With gentle control, you can now have those precious butterfly pieces. I've seen some crazy devices to crack macadamias. Twist, twist, twist! How aggravating! Now you can have whole macadamias in record time and less than half the effort. My wife loves Brazil nuts. What my wife wants, she gets! Now she gets whole Brazil nuts. I'm a happier man for it.